Blueberry buckle is a stunning cake filled to capacity with plump, juicy blueberries. It’s one of my favorite blueberry recipes, and more specifically, it’s one of my favorite Martha Stewart recipes. It all started when Joe ran errands yesterday. He came home with 2lbs of fresh, local blueberries and I immediately thought of blueberry buckle. I hadn’t made it in a couple years and decided to whip it up last night. The Blueberry Buckle Recipe comes from the July/August 2000 issue of Martha Stewart Living. I clipped the recipe from the magazine in 2000 and kept it sealed within my recipe album, a big binder stuffed with clipped and written recipes. There is just enough batter to hold the berries together and to maintain a cake shape after baking. Folding in the excessive amount of blueberries can be a struggle, but be gentle that you don’t squish the blueberries during the process. The batter will be thick and you’ll need to smoosh it around in the springform pan. The result is a blueberry dense cake that is fruity and filling. Now, with this much fruit in the cake … I have to wonder and assume this is a healthy cake. With so much fruit, how can it be bad for you? It was delicious but of course I was eating it with a side of butter. Maybe the clotted cream on top will make this unhealthy, but otherwise I see no problem!!! 5 to 1, wow!!! This looks fabulous. I used to have a blueberry buckle type recipe somewhere in which the batter is lemon flavored with the help of a little lemon juice and grated lemon rind. I thought it was terrific, although I’m one of those people who thinks that lemon and blueberry are meant to be BFFs! I have a backlog of recipes to try (received a pudding mold as a gift, so my next self-directive is to make a steamed pudding! ), but I ought to try and recreate my lemon-blueberry buckle one of these days. If I do I’ll send the recipe your way! Oh yum! Wonder why it’s called a buckle…do you “buckle” at the knees when you eat it? This sounds lovely, and I agree – it has enough fruit in it that we can consider it healthy! Great endorsement- I’ve printed this out. 3/4 cup sugar and 1 stick of butter don’t sound like too much for a cake. You’re right, the excessive blueberries must make it slightly healthier! Next time I have a big bounty of blues, I’m all over this recipe! Allen a succulent & fragrant cake. I see that the concentration of berries is in intense..much better! Hey Allen – we are so often on the same page! I did mine with raspberries and blueberries. I like the idea of unmolding it the way you do. And remember our discussion about Dutch Babies awhile back? I’ve got a savory one upcoming based on your concept. OHHHHH MY goodness. Can I just eat the topping please??? Oh but wait I cant pass up the cake part either. ahh hell, just give me the whole thing! Thanks, everyone for the ‘ooooohs’ and ‘ahhh’s’ ;-) We’re already down to the last piece which will be gone before nightfall! You know, I didn’t happen to research buckles … but I seem to remember that the name stems from the cake ‘buckling’ to hold in the large amount of berries. It certainly sounds like a reasonable definition, don’t you think? Natalie – no tweaks made – it’s pure Martha all the way! my favorite berry! this is just gorgeous, & intensely berrllicious. wow… so many blueberries. this wasn’t soggy at all? Holy crap, that looks absolutely sinful and delicious!!! Tia — nope, not soggy any of the times I’ve made it. It will be moist and dense but not runny or soggy. It should be made with fresh blueberries (rinsed and towel dried). Beautiful. I love the look of it, rustic with a generous ratio of berries. Must buy a springform. sometimes i like a little cake with my blueberries. the next time i find myself with an excess of blueberries, i hope this recipe comes to mind. good heavens, that streusel. mmm. 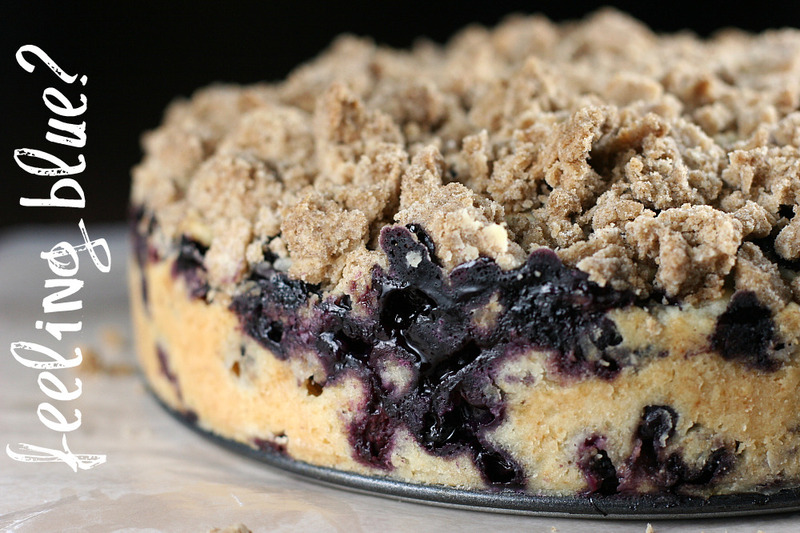 That blueberry buckle looks so good! Oh my, I do want a large wedge of this. Wow, that does look incredibly amazing! I happen to have a lot of blueberries to use…and I happen to love any recipe that lets me bust out my springform pan. Thanks for the post! This looks tasty! I actually just posted about a blueberry buckle that was really scruptious too. I agree with you on the multiple berries though – If I made the one I posted again I’d add another cup at least! That really is a stunning photo. It certainly makes me want to go out and buy some blueberries. This looks great. We attended a local blueberry festival this year and stocked-up. My 9 year old researched a recipe and made a blueberry pie from scratch, including the crust and it was incredible.